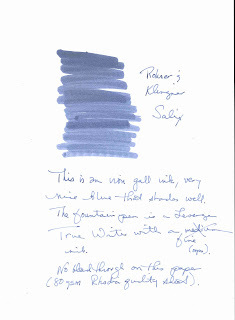 Goulet Pens recently added the Rohrer & Klingner ink line to their product lineup, and one in particular caught my attention: the Salix Blue iron gall ink. There is something about using an ink formula dating back to the 12th century that really makes me feel a bond with my fountain pen--the sheer amount of time it took to create ink, never mind how little might be made from a particular batch, indicates (to me) the strong desire of humans to communicate through the written word (as well as show off one's elite status as someone who can read and write). Traditional Iron gall inks are corrosive, and will eventually destroy the paper as well as the fountain pen. The modern iron galls are gentler on the inside of a fountain pen, but can still be corrosive if left in the pen for a long period. So when using an iron gall ink, like Diamine's Registrars ink or Chesterfield's Archival Vault, I don't leave the ink in for more than a week or two at a time, and give my pen a more-thorough-than-usual cleaning as the iron gall ink can be difficult to remove. 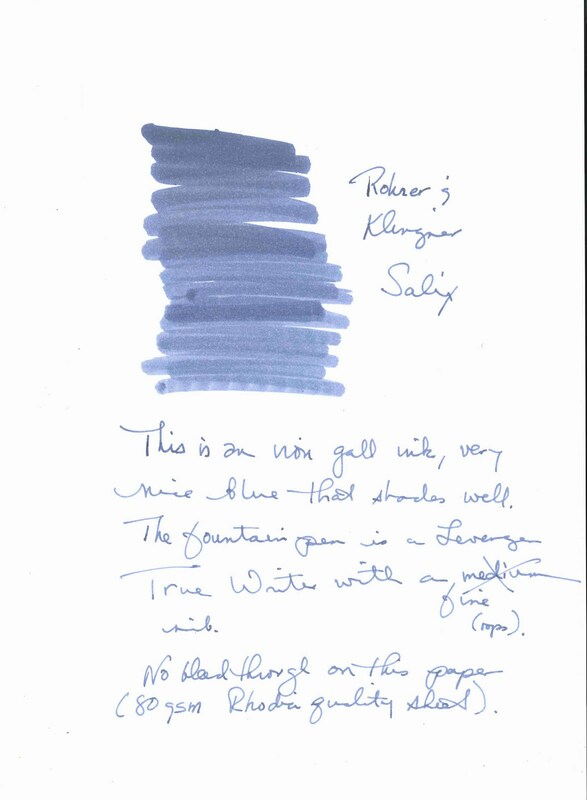 Rohrer & Klingner's Salix Blue is a blue-black formula, like Diamine and Chesterfield, but unlike those two it doesn't oxidize into black but remains blue. This is really one of the more stunning blues I've used, very deep color with good saturation of the paper (which is 80gsm Rhodia-quality). Drying time is average, and there was no bleed through so double-sided writing is fine. Definitely a great ink if you want something that's permanent and waterproof (I didn't test it, but iron gall inks seem to be waterproof so I'll take Wikipedia's word for it) then you should give this a try. Especially as the color remains blue on the paper, rather than turning black. 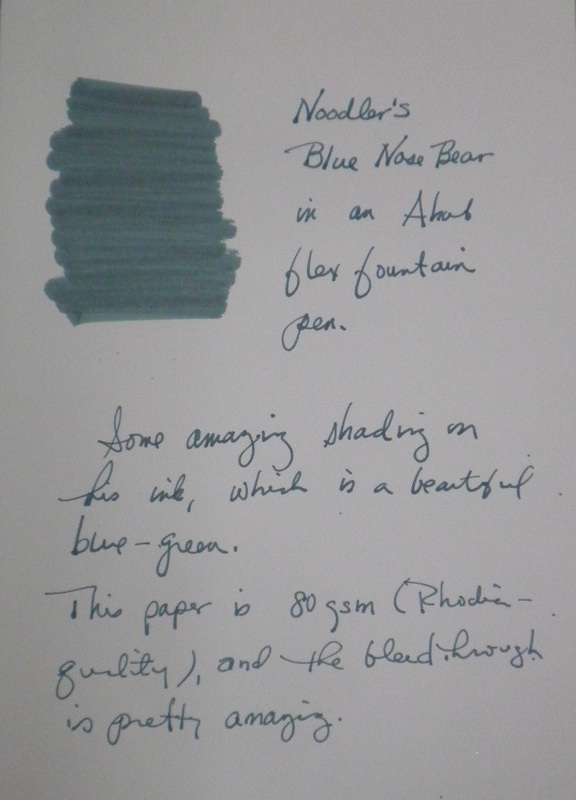 Here's a quick review of Noodler's Blue Nose Bear ink, which is one of the softest and loveliest blue-green inks I've ever seen. (If you click on that link, definitely scroll down and cCheck out the two videos Goulet Pens has posted showing off Blue Nose Bear.) I'm using one of the new Noodler's Ahab flex nib fountain pens, and the nib is very big and flexible so you get a good idea of how this ink looks. 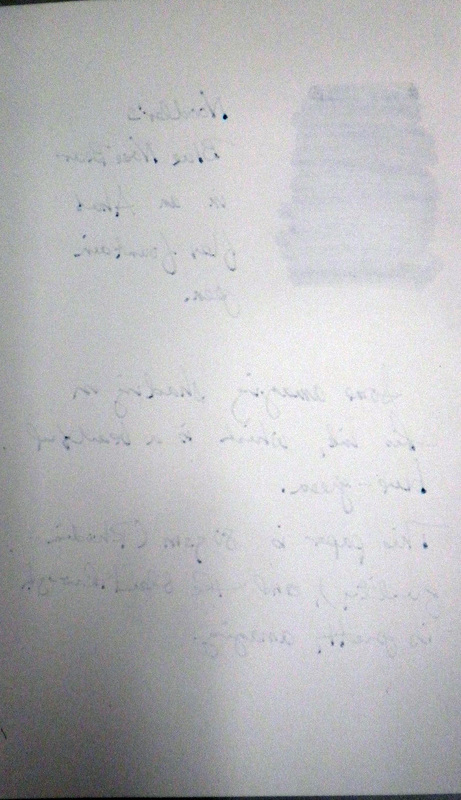 The ink seems to be very wet in the Ahab, flowing all over the place and I actually had a few spatters on the page. As I wasn't pressing very hard on the nib, I presume it's the ink. We'll see when I try it in one of my Japanese fine nibs, then it might be better behaved. 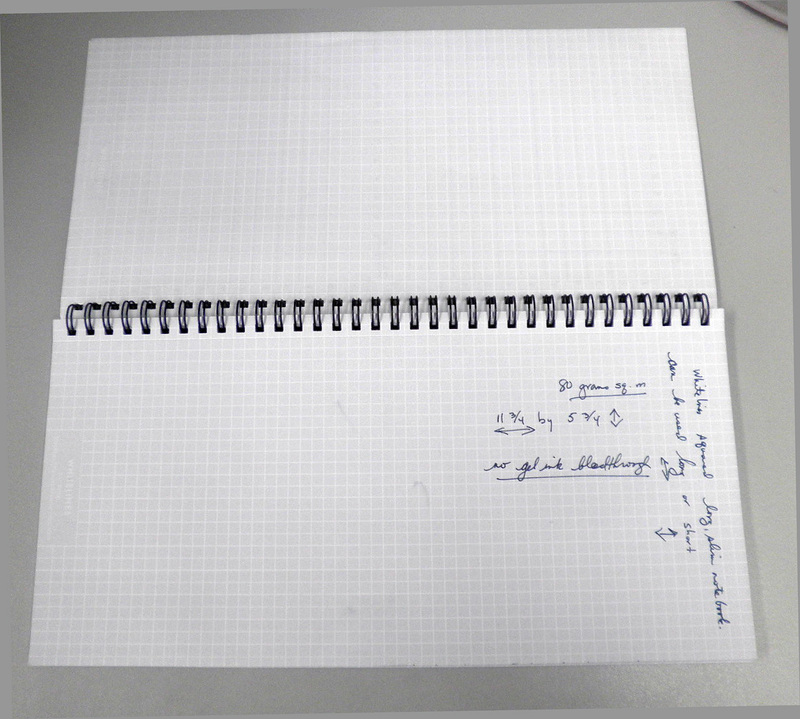 The paper I was using was an 80gsm stock I have on hand (Rhodia quality, if you will). I was very surprised at how much bleed through there is with Blue Nose Bear, double-sided writing isn't going to work too well with this ink--at least not using the Ahab flex, but maybe with a finer nib. Drying time and water resistance are average--it's a wet ink, so expect it to take some extra seconds to saturate the page (perhaps a bit too much) and dry, and it's not waterproof so getting it wet will lead to ink running off the page. It does have some fluorescence to it, and it is forgery-resistance if those qualities are of interest. But if color is your thing and you are looking for a new blue-green with exceptional shading, then Blue Nose Bear is for you. A recent Lost Crates item was this colorful ballpoint pen from Mark's, a Japanese stationery and pen company with some really interesting items (like the notebooks shown in this catalog on the Mark's Europe website). The packaging alone was stunning, a silver-gray box (at first I thought I'd been send a Lamy pen) and the pen packed inside a clear tube with silver caps. Really quite beautiful. This ballpoint has a magnetic closure, so when capped it fits tightly and won't slip off. That's something I really appreciate, as I don't like carrying a pen when the cap has been misplaced. I've swapped out the ballpoint ink refill and put in a MonteVerde gel ink cartridge, so I can have my favorite gel ink in the new pen. 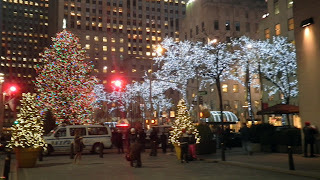 Not much posting for the next few days as I'm doing various projects as well as getting ready for the holidays. 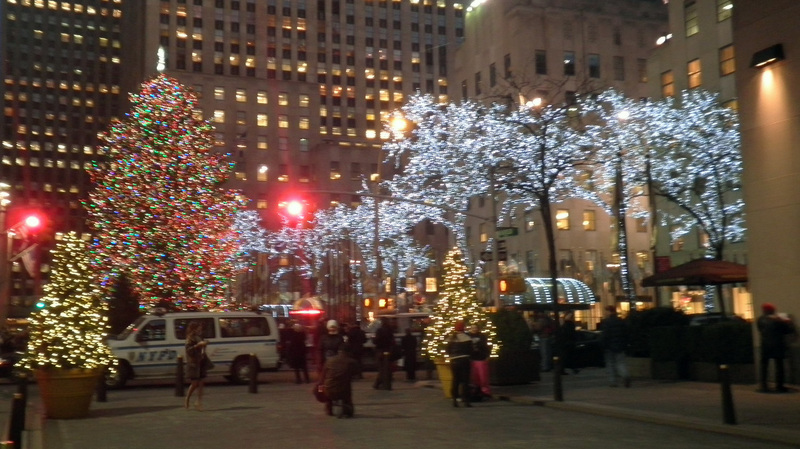 I was near Rockefeller Center the other night and took a few pictures of the tree to post, not very good but you get the idea. I was about 50 or 60 yards from the tree when I took this one, I'm always amazed at the height of the tree. 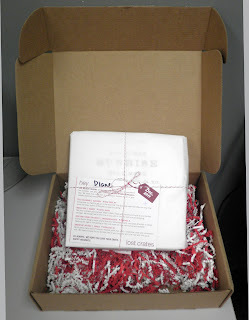 The December 2011 Lost Crates package arrived last night, and it's quite interesting (am I the only one who remembers that you don't combine red and white as it's bad luck?--it symbolizes blood and bandages). Naturally there's a calendar, the Quotable 2012 calendar. 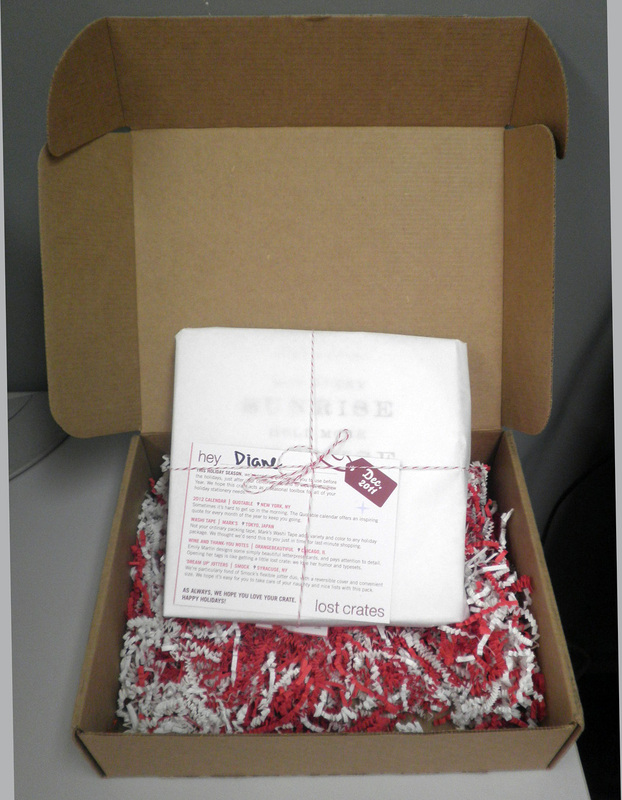 Then there is a pack of wine and thank you notes, small note cards by OrangeBeautiful using Emily Martin's designs. They are all quite lovely, and I've already used one for a bottle of red I'm giving to a friend tonight. The paper component of the package is a pair of Dream Up jotters by Smock, small flexible 40 page notebooks made in upstate New York. Finally, two items from Tokyo: Mark's Bicolor Pen (the pen is bicolor, not the ink) and Mark's Washi tape, which is quite lovely. I'm looking forward to trying both, especially the tape for a few projects that need some decoration. 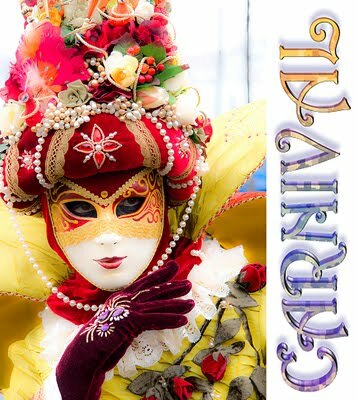 To start off the Carnival, here's a great post on favorite pens by Nifty of Notebook Stories, founder of this monthly extravaganza. 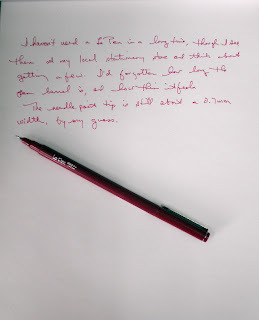 Tom Lynch at Went Sketching has a fantastic post featuring one of my favorite pens, the Pilot Falcon. 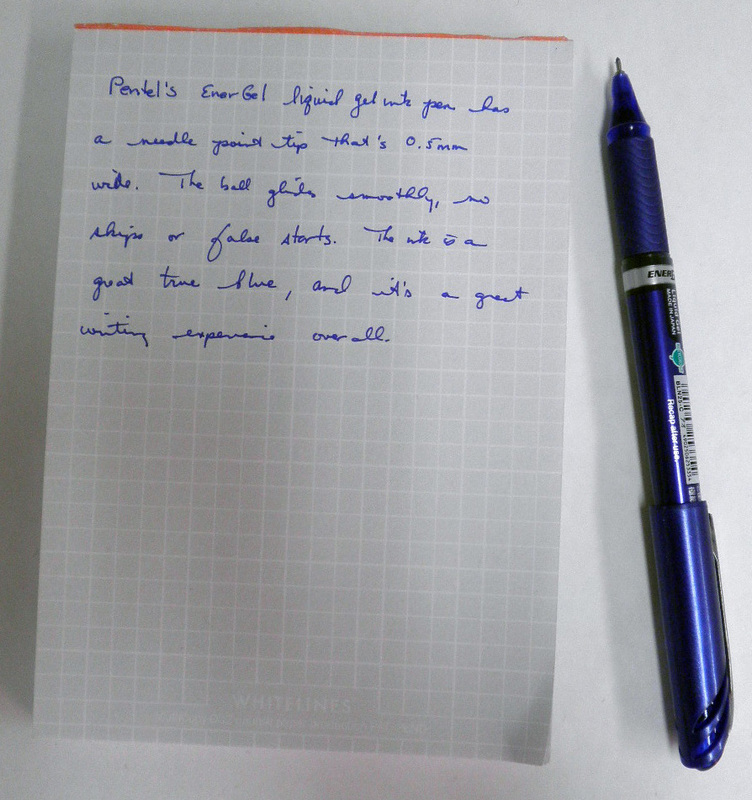 He's also got a review up of the new Noodler's Ahab flex fountain pen which is a must-read. Economy Pens puts a Zebra in tulle, or something like that (sounds like something out of Fantasia, with ballpoints and gel inks dancing around a fountain of Noodler's Black Swan ink). 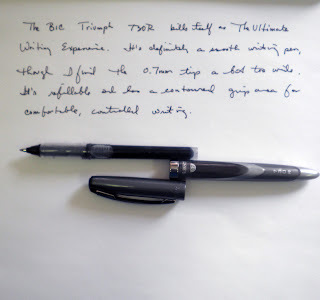 Multi Pen Dimentions has a great review of the Pilot Hi-Tec-C Coleto in metallic gray, there's something very Klaatu Barada Nikto about that pen. While I don't watch Mad Men that often, whenever I read about the show I think of the guy who runs their supply room. Here's a great picture of Parker Jotters in a rainbow assortment. 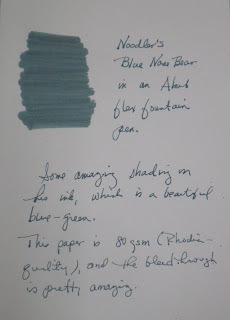 Inkophile has a great review of Noodler's Blue Nose Bear, an ink I'm tempted to buy just for the name. Over at Does This Pen Write is a great post comparing markers, Cra-Z-Art versus Crayola. Goldspot Pens has a really nice post on alternatives to buying a Mont Blanc. 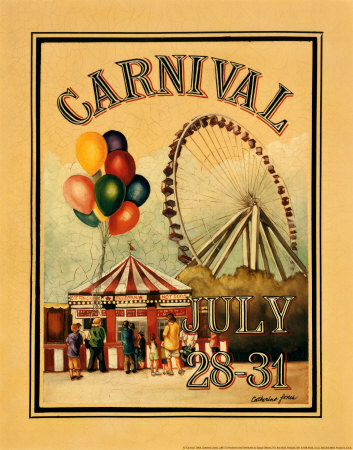 I love that Laban pen, and I wanted to put this in the Carnival since every midway needs its sales stalls. Plannerisms took a poll asking a seemingly simple question: white or cream? Paper that is, and the results were surprising. Peninkcillin has two posts I want to highlight: a review of Waterman Havana Brown Ink, and this review of the Kaweco Sport Classic Fountain Pen. 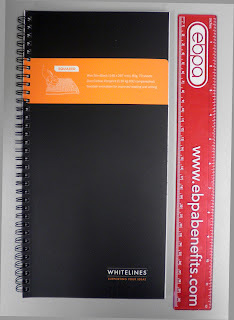 Kim at Tiger Pens Blog reviews the Pentel Lancelot Ballpoint, one very attractive pen I might add. Via Dave's Mechanical Pencils I cam across The Catalogue of American Mechanical Pencils by Jonathan A. Veley. This looks amazing, and you can purchase it as an ebook or on a CD, or the photo supplement alone. 777 Pen Repair has an interesting post on Noodler's ink, is it dangerous? 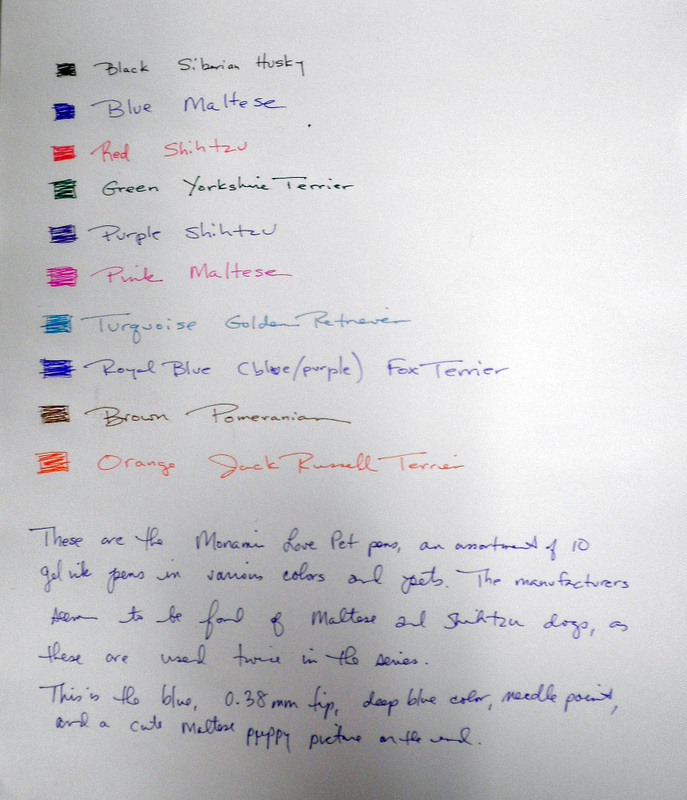 There have been many posts on different forums about the corrosive qualities of certain inks on fountain pens, so take a look at Tyler's thoughtful writing. Nancy Olson, Ink always has some amazing photos of pens, stationery, and more over at her place and this Lominchay Riviera Waves is no exception. The Pen Addict hosts a guest post by Bryan on the Pilot Prera, definitely a fantastic little fountain pen. Finally, Brian Goulet over at Ink Nouveau has a really great tutorial on Goulet Pens' swab shop, which in itself is one of the most valuable sites on the Internet. Hundreds of q-tips gave up their cotton so that we might see Diamine Twilight ink on white and ivory paper, so do head over and take a look. Update: Looks like at least one submission didn't make it through to me (I've had that happen too), and it's a good one from Julie (Okami) at Whatever on the Franklin-Christoph Penvelope. Update II: Steven H. submitted these great posts that also didn't get through to me, one on a custom-made desk organizer and the other on the fabulous new TWSBI ink bottles. 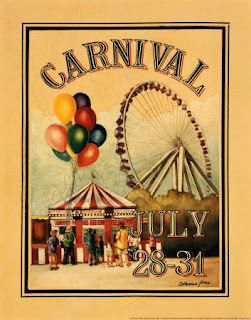 The next Carnival of Pen, Pencil & Paper will be on Tuesday, January 3, 2012 and is hosted by Goldspot Pens. You can submit posts here. With apologies to Marcel Duchamp, and not really an action photo of how she climbs up the side, I thought I'd share this photo. 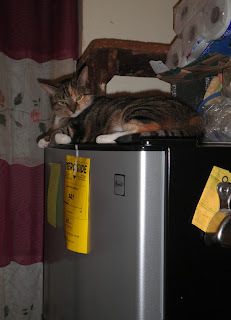 Mally has learned to get up to the top of the new refrigerator, where she may survey her kingdom at her leisure. An alpha cat in all her glory. Three new blue inks I'm checking out, ink samples I ordered from Goulet Pens. 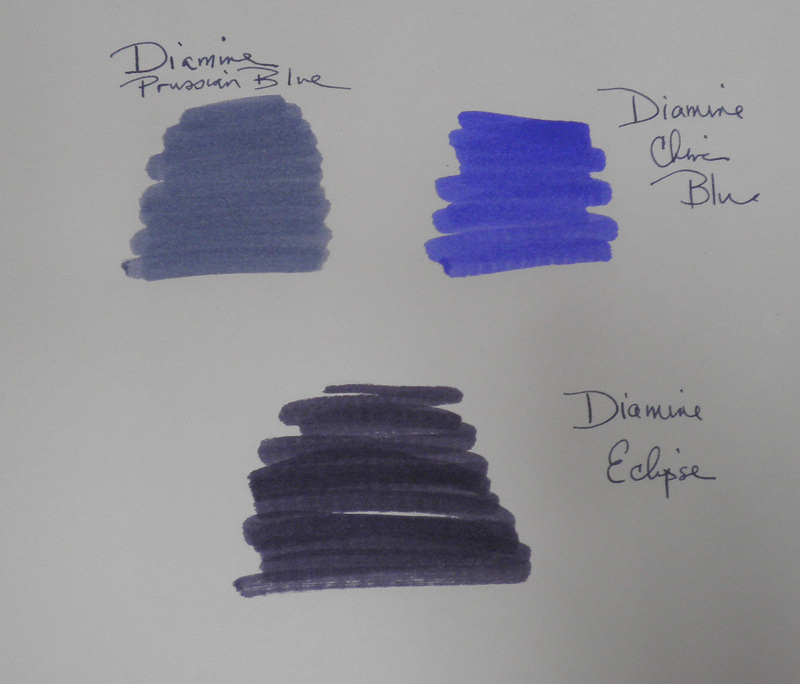 All are Diamine inks, which I think are top notch: Prussian Blue, China Blue, and Eclipse. Prussian Blue is dark with a touch of black. China Blue is bright and noticeable. Eclipse is very much a blue-black ink, reminding me a bit of an iron gall ink that's started to change color (like the various Registrar inks). 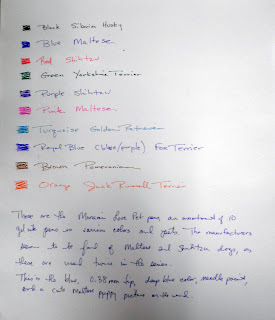 Trying them out before buying is a great way to see and sample ink colors you might not want, or finding out that you already have a similar color. Definitely check out Goulet Pens for ink and the rest of their marvelous items. Many thanks to everyone for their comments. 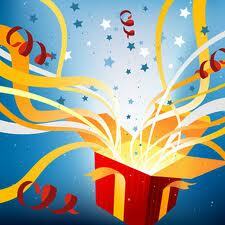 Listed below are the winning posts, along with a third giveaway that I decided to do on the spur of the moment. I used Random.org for the winning numbers, entering 1 and 41 (my post is excluded from this, obviously) but the below copy shows 1 and 100. Congrats to the lucky three people below. They should email me (diane.fennelATgmail.com) by Wednesday noon and I'll arrange deliverly. Again, thanks to everyone who commented and a big thanks to Brad and JetPens.com for spreading some cheer. JetPens is trying to steal all my money. I am assured of this. But that Field Notes steno pad sounds pretty great... I've never tried Field Notes before! 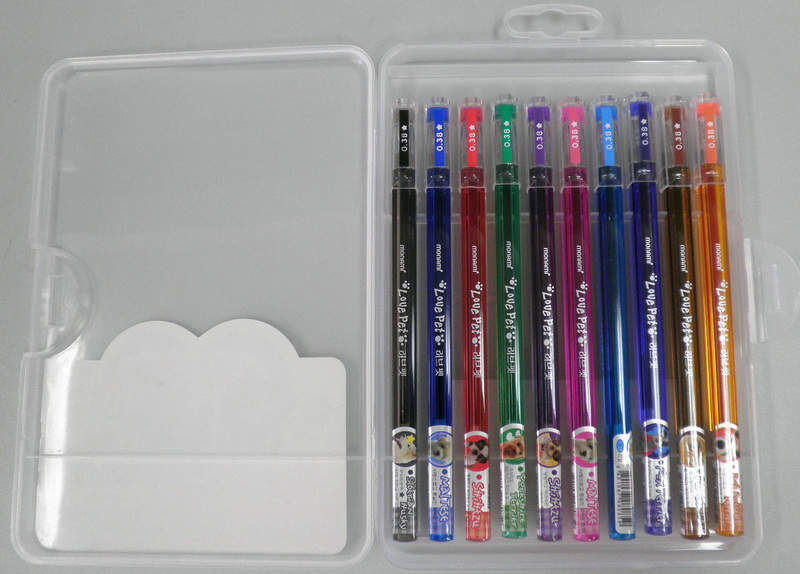 I love gel pens with different colors, and Jet Pens is the perfect place to get them! In addition, they've saved millions of people from having to write in an unattractive journal. I've been using gold paper clips for a long time, enjoying the way the color looks next to white paper as well as standing out in the midst of regular steel gray clips. 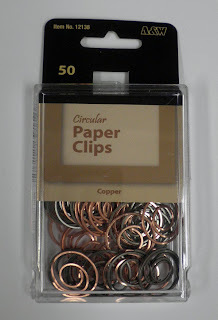 Different types of clips are interesting to me, and so I was thrilled to get this small gift from frequent commenter and guest post author Jack/Youngstown of circular copper paper clips. Jack's note along with the clips pointed out that while New York City offers so much, there might be a few things that are harder to find. 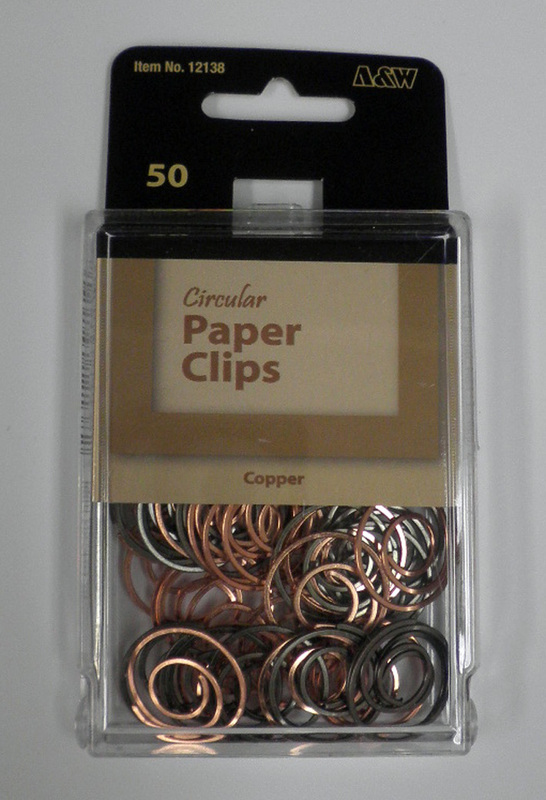 And it's funny, but I don't recall seeing these paper clips in any of the stationery stores I frequent. Even more funny because they are sold by A&W Products of Port Jervis, NY, not very far from the city so you would think they'd be everywhere in Manhattan and the other boroughs. The clips seem almost Celtic pagan in their design, as if someone just dug them up from a bog or burial site. They look great next to white paper, and there are two colors in the box of 50: regular copper color and a darker grayish color that looks a tad like pewter. Stylish, decidedly different, and fun as well--these will add some interest to my paperwork in the future. Brad Dowdy, first known to all of us as the Pen Addict and more recently as the marketing chief for JetPens.com, has very generously offered a $10 JetPens gift certificate in a giveaway here at Pocket Blonde. In addition, I've gone through my stash and have a second giveaway item to add to that, a new Field Notes Steno Pad, a 6 by 9 inch spiral top stenography book that's great for all your note-taking needs. Leave a comment to this post below. Comment 1 is #1, comment 2 is #2, etc. Comments can be on anything, but please do muse on the wonderfulness of JetPens and/or Field Notes if you are so inclined. The contest starts now and closes on Saturday noon. Two winners will be drawn using a random number generator, the first will win the JetPens gift certificate and the second will win the Field Notes Steno Pad. 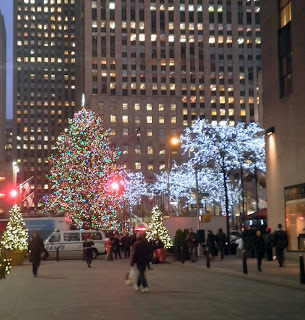 Winners will be posted Saturday, December 3 around 5 pm, and they will have until Wednesday, December 7, at 5pm my time (NYC) toPost Options contact me to arrange for their gift to be sent. If the first winner doesn't get in touch with me, then the second winner moves up a place and a new comment will be chosen for the Field Notes Steno Pad. 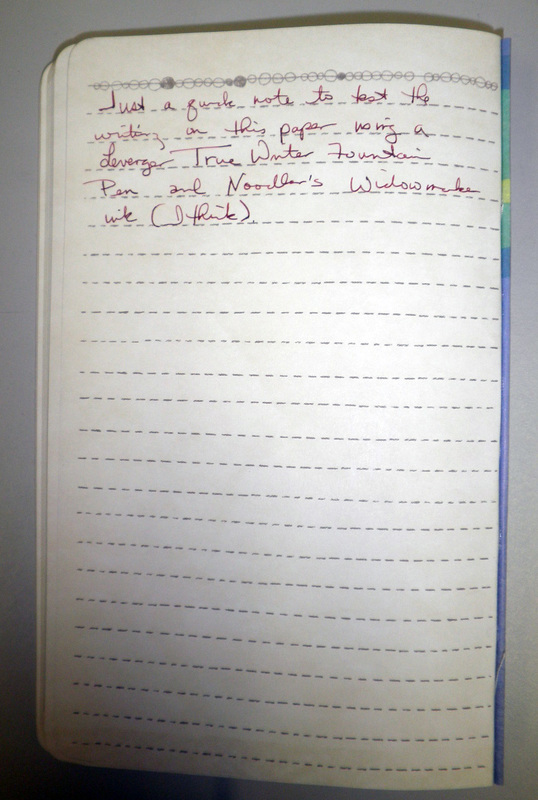 If the second winner isn't available, then a new comment will be chose for the Field Notes Steno Pad. All decisions are final, but please do enjoy the giveaway. 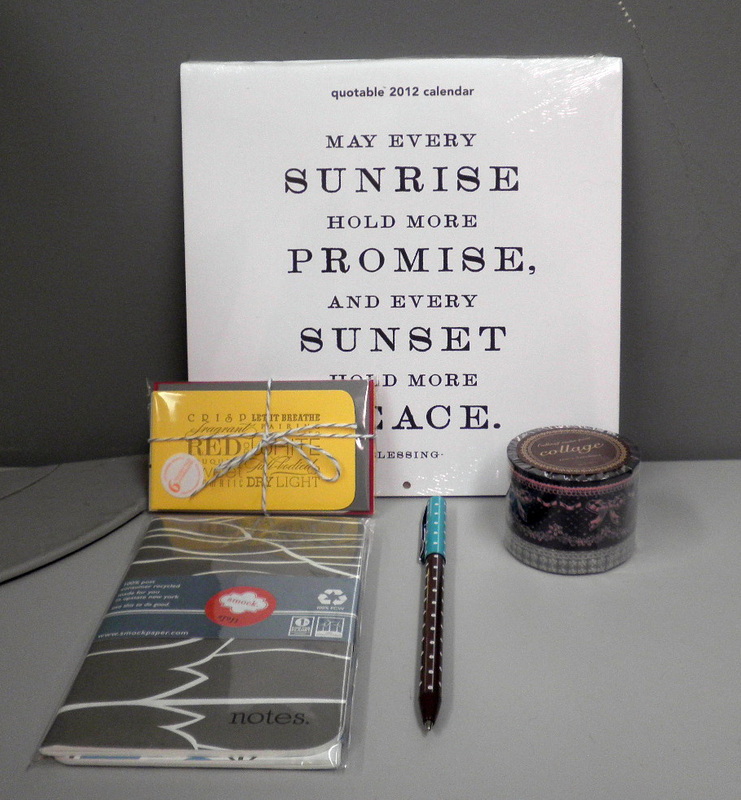 Thanks again to Brad and JetPens for their thoughtfulness to Pocket Blonde's fans. This caught my eye at the local stationery store, and while I hardly ever use colored paper I was struck by its smoothness and deep colors. This Grandluxe Fantasia Color Pad measures 8.3 by 11.7 inches, with 70 sheets and seven beautifully rich colors to write on. 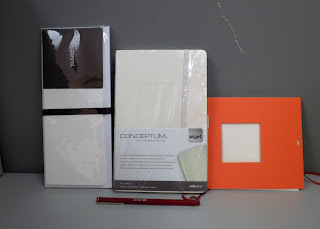 What surprised me is that it's not construction paper or something equally heavy but 80gsm writing paper, the same as a Rhodia notepad or webbie. There is a larger pad also available, as well as a memo cube that looks adorable. I haven't tried writing on it yet, and that may be as I'm thinking of a JetPens order and one of their white ink pens might be a great way to try this out. Colored ink seems to be a must with this, but other than silver and white I don't think anything will show up on the darker colors. No matter, it's a fun pad that will definitely add something extra to your writing. 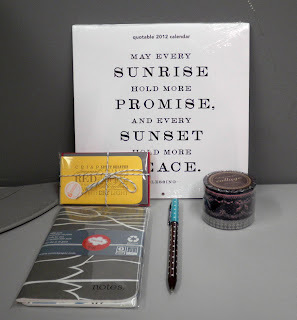 Various holidays are fast approaching, and a particular Pen Addict had a great suggestion that I post a gift guide. Below are some ideas for gifts large and small, things I wouldn't mind giving or receiving (or both!). First up is JetPen's Cplay Sevenroll Leather Pencil Case, which has been on my radar since they arrived. The Sweet Cherry Red leather roll case is bright and fun, but there are other colors to choose from as well. Fill it with lots of different pens, such as this Uni-ball Signo RT with blue-black ink (my favorite! 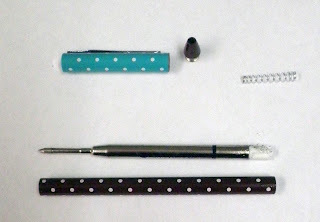 ), a Kaweco Sport Fountain Pen, the Lamy Safari in Charcoal Black, and the Ohto Rook Fountain Pen with a black/red body. Also take a look at the Palomino Blackwing wooden pencils, re-introducing a much-loved classic. 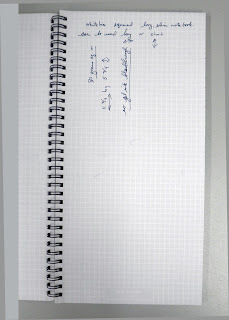 Since you'll need something to write on take a look at the Rhodia No. 16 dotPad. 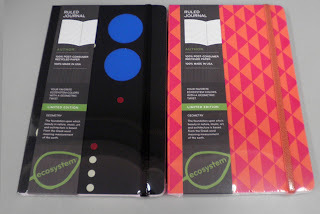 If you'd prefer a pocket memo book, then another great addition to the JetPens web site is Field Notes, so check out their offerings of Memo Books and Steno Pads. To add some color to the festivities, here's a set of glitter markers by Kuretake that look fabulous, or a set of multi-color crayon sticks. Writer's Bloc just added the Myndology notebooks to their line up of stationery, a disc-bound notebook that's very much like Levenger's Circa notebooks but comes in jellybean colors as well as staid earth tones. Another Writer's Bloc notebook I'm very fond of is the Clairefontaine Catitude line, which just completely captures the essential nature of cats. If you know someone with a real feline and, therefore, a real litter box to take care of then Way of Cats' Littermint might be a nice gift as well (stop by the blog and say hello to Tristan and the gang). Finally, these Alice in Wonderland Screen Cleaners are both practical and totally eye-catching. Renaissance Art has a lot of fantastic leather cases for Moleskine notebooks, Kindles, Nooks, iPads, and more, as well as their leather journals and custom work. Doane Paper is always a great place to browse and shop, the grids + lines concept is a winner and all of the products are fantastic. I am especially fond of the three-pack of large notepads, a staple for me. Lost Crates is a fun option, and if you're lucky and quick you might snag one of the much-anticipated Noodler's Ahab flex nib fountain pens at The Goulet Pen Company. And for the Elvis fan, Goldspot Pens has the Limited Edition Elvis rollerball showcasing Jailhouse Rock. 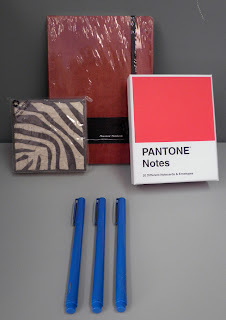 Next Monday there will be a giveaway post, including something from JetPens.com (many, manythanks for this) and a notebook or two from my personal stash (Lost Crates, anyone?). So do keep an eye out on this space. 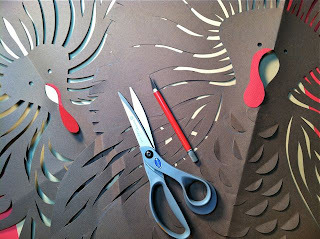 And have a wonderful Thanksgiving! Went Sketching's at it again with all his talent, I'd be jealous if I wasn't so tongue tied. 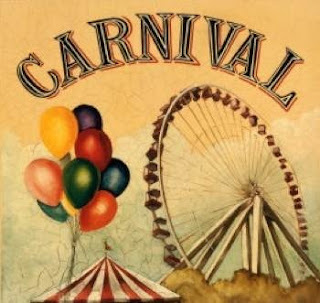 I am hosting the December Carnival of Pen, Pencil and Paper, with the post going up on Tuesday, December 6. 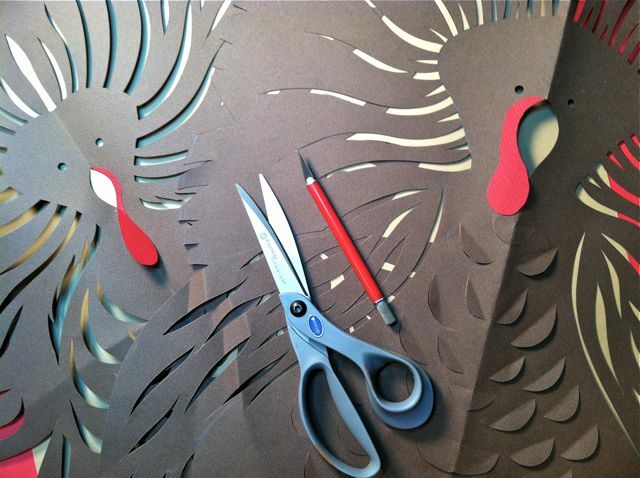 Entries are due by Sunday, December 4, you can submit here. Got an email from Tokyo Pen Shop that mentioned a new pen they were carrying called the Pilot Timeline Gel. What a beautiful gel ink pen, the colors are amazing. So is the price, but looking is free. Check out TPS on Facebook too. Stopped by my local stationery store last week and saw this Whitelines slim wirebound notebook with squared paper and interesting size. It's 5.75 by almost 11.75 (not 11), with 70 pages of 80gsm paper that's very gel ink friendly--no bleed through or shadow at all. 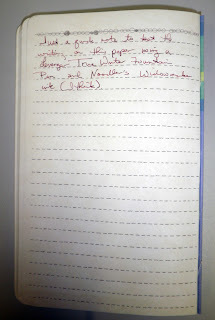 It reminds me of the Rhodia reverse book, one of my favorite Rhodia notebooks, and the Le Carre staple-bound notebook. But the former is rectangular while the latter is square, so this Whitelines is a longer, slimmer way of taking notes or working on designs. 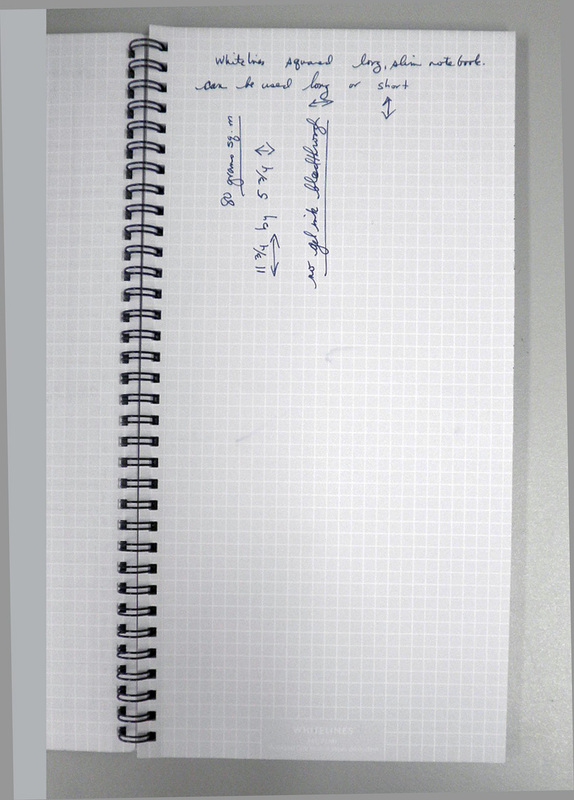 Sideways the Whitelines slim notebook is equally good, and I could see using it when space is limited and I can't get the notebook vertical on a flat surface. I've got this page set up to mark a knitting pattern I'm about to work on, a two-part scarf with 12 rounds of a 12-row pattern. As I'm just beginning to learn to read the knitting, rather than the chart, I still need a way to mark off what I've done. This Whitelines slim notebook is perfect for keeping tabs on the scarf's progress, while a comfortable size to slip into my knitting bag. 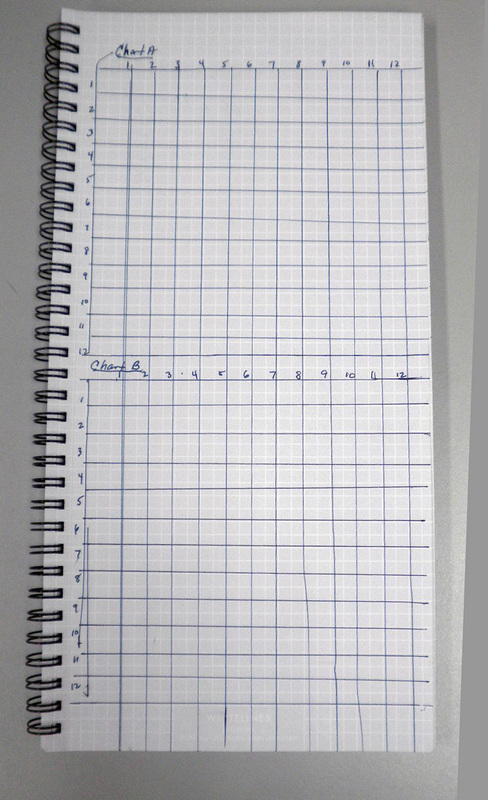 What amuses me is that I've drawn in the lines of the chart, rather than rely on the squared Whitelines paper to keep me on course. 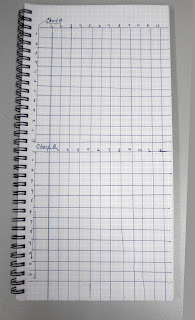 And that makes me wonder, how many other people use square paper and then draw the lines of the graph? Habit is my first thought, but also fear of not seeing the squares and misunderstanding what I've got in front of my eyes. Are others as redundant/nervous as me? A recent addition to office supply retailers is Poppin, an online store with tons of sleek products for your desk. I've been all over their site looking at various pens and stationery supplies, but not really thinking of ordering yet as I've got lots of stuff in my stash that I have to get through firsts. But Lost Crates sent me three of Poppin's Signature Blue Ballpoint Pens in my November package, and I couldn't wait to try these. I love the look, very simple uni-color with an edged clip that I find very attractive. The pen is refillable, so I can replace the ink with something else once I determine what will fit. Could go with a gel ink, or maybe a blue-black color, whatever takes my fancy when it's time to refill. 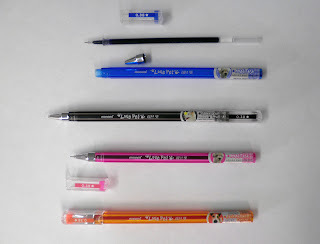 These are basically no-frills pens that are sturdy and solid, with clean lines and a good design and production. The plastic fits together well, and there are no seams or nubs showing the molding process. The pen barrel feels a bit wider than my other pens, but that may be due to the lack of a rubber grip (which presses in a bit, giving the impression of a thinner pen). 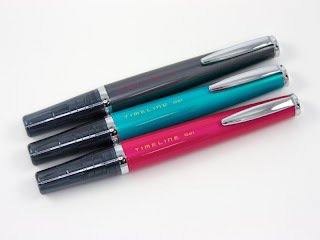 For the price ($6 for 12 pens, then add in shipping and tax if applicable) it's a very worthwhile purchase, especially the fantastic color range (11 colors in all, including turquoise, magenta, two blues, two greens, red, black, and brown). The pen does skip a bit on starting, but then the ink starts to flow regularly and writing is normal and smooth. Thinking of getting some office supplies, and don't want to do another Staples order? Definitely try Poppin, the pens and paper look fantastic as do the desk accessories and other products. 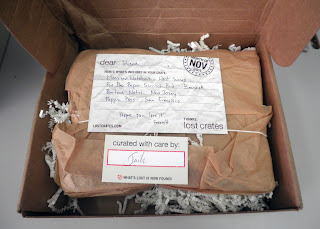 My November Lost Crates shipment arrived, and first thing I noticed was the wonderful card added to the box noting that this package was curated by Jack. Garret signed the other card, so thanks to both of you for an interesting box. a box of Pantone notes, with 20 different color cards and envelopes. three Poppin blue ballpoint pens, which I've been wanting to try. I'm really looking forward to using and reviewing all of these, great job Lost Crates! Great post at Went Sketching, very impressive art work and client! Over 30 years ago Marvy Uchida introduced this long, sleek plastic barrel pen with a micro-fine tip and dye-based ink that adds some pop to the color. My favorite was the purple, but all the pen colors were beautiful and I was hooked. I think part of the attraction was the name, Le Pen--as if it came straight from Paris even though the barrel is clearly marked Japan. Another part of the attraction was the clean design of the pen itself, just a slim round barrel and blunt-cut cap so unlike the BIC ballpoints we used for work, school, and home. Although I see these all the time at various stationery store, I hadn't thought to get one until a burgundy Le Pen showed up in last month's Lost Crates shipment. And it's just as I remembered it--the tip seems a bit porous and flexible, more like a sponge than a nail, and the line width looks wider than the claimed 0.3mm. I will definitely have to do a line match up to see where this Le Pen fits on the width scale, but for now it seems more like a 0.5mm or 0.7mm and that may preclude it from really fine line work. But Le Pen retains its smooth writing style, and just has a great hand feel. The burgundy color seems very red, not as brown as some in that shade. The indented barrel end and very tight click-fit cap, as well as the indented silver clip, add to the overall attractiveness of the design. I remember now that it was one of my favorite pens, and I'll be looking for more to add to my collection. Many thanks to Brad and JetPens for sending me this Pentel EnerGel needle point liquid ink pen, which writes like a dream. I love the true blue color of the ink, which does dry fast. There's something elegant about needle point tips the longer I look at one, although I can find them at times a bit disconcerting on first sight. I like how regular pen tips taper from the section down to the ball of the tip, and needle points seem strange and spiky. I find myself looking for my needle point pens now because they are great for writing in really tiny spaces such as marking errata on knitting charts, which I've been doing a lot of lately--both knitting and catching mistakes in the pattern. With little space in the book for making changes, needle point tips are essential for correcting these errors and making notes. So the 0.5mm width of this tip seems quite good for what I need, but a 0.4mm or even 0.3mm would be great as well (if only EnerGel pens came with those tips!). 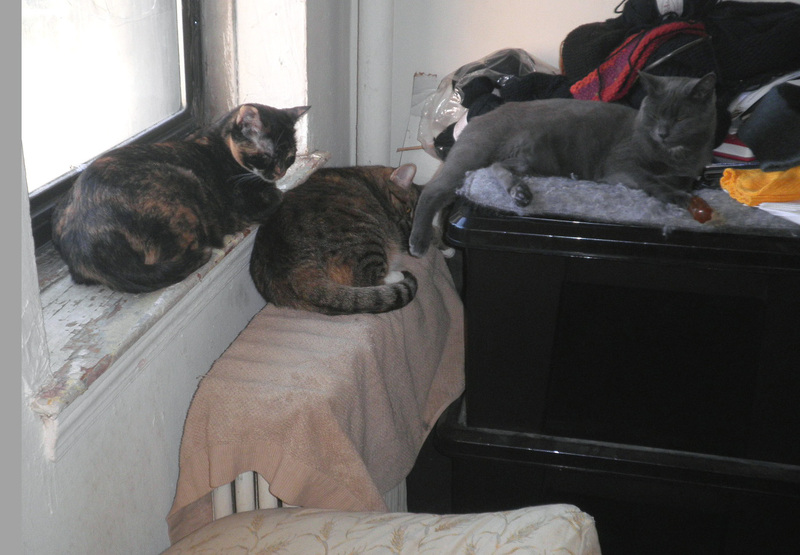 I've never seen my three girls lounging this close. But as we all know, the best place to sleep is (left to right) on the windowsill (Seranne), on the radiator (Mally), or on mom's knitting (Theia). Check out this blog post by Fountain Pen Geeks on Michael Sull and his American Cursive Handwriting, a 349 page guide to traditional cursive handwriting in the US. That is amazing, I'm thinking of ordering the Reference guide. I've been a bit ambivalent about my October Lost Crates shipment, not because anything was terrible but because it was so...blah. Nothing really excited me, so I've been putting off showing the Crate haul. From let to right: Pressed Ink set of 10 thank you notes,Conceptum soft cover blank journal ("the new notebook with numerous practical functions"--if it would make coffee for me in the morning, that would be new and practical as well as greatly appreciated); Semikolon photo booklet; and in front, a Le Pen by marvy Japan in burgundy. The latter is probably the one item that got my attention, as I remember when those came out about 35 years or so ago and I loved them (and still do). Not a bad group of products, but for some reason I just can't get excited about any of these items because I don't tend to use many of them (I'm not a photo booklet person, and I have stationery I use for thank you notes). The Le Pen will be reviewed, and that's about all for this Crate. I'm looking forward to November, just to see what type of pen they put in. 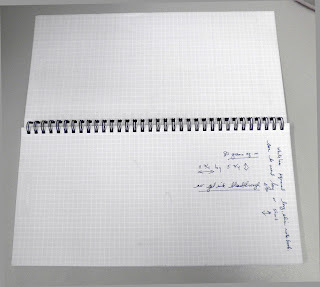 Great post on drawing with carpenter pencils by Tom Lynch at his new blog, Went Sketching. 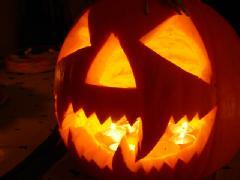 Take a look at the Halloween cut outs as well, spooky! Cheryl at Writer's Bloc very generously offered me a journal to review from their Compendium line, a name I wasn't familiar with that has an assortment of message journals that look to add a little hope and inspiration to your life. 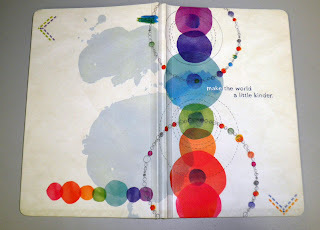 In particular is this Write Now Journal with the "Make the World A Little Kinder" motif that immediately grabbed my attention: it's a really beautiful image of the 7 chakras centers on the front cover. The front and back view is beautiful, with the vibrant Roy G. Biv assembly of circles on a page green-gray background. I'm impressed with how bright the inks are and the overall design of this journal; the others in the series are equally compelling, but I have to say this one is my favorite. 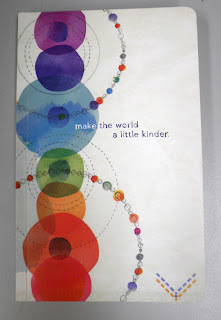 The cover is flexible, and has a light grain texture that's actually pleasing to the fingertips. Measuring about 5 by 8 with 128 pages, it's a good journal for every day use. 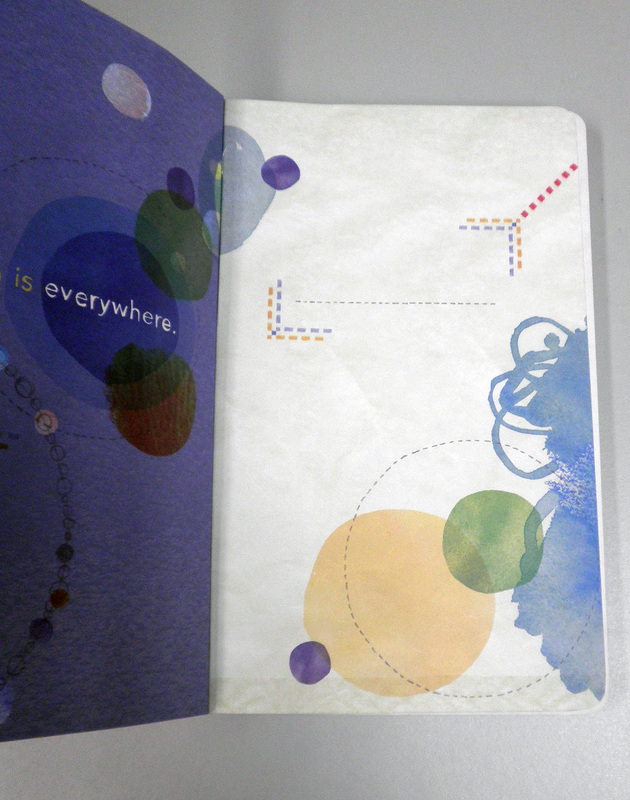 Inside you see the pages, which are printed in soy ink on chlorine-free paper. The paper is actually a bit on the scratchy side, I could feel the tip of my fountain pen going over it but there wasn't much resistance and the surface actually feels smooth to the touch. Every 6 pages is separated by a colorful buffer page containing a quotation, which adds a nice touch. 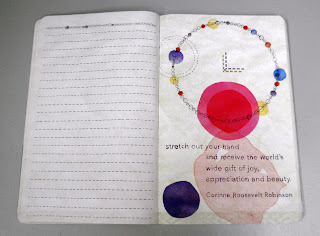 The inside cover has a space for writing your name or whatever you want to put down, with a lot of colorful images that add to the overall appeal of this journal. That, and the price, make it a winner! Fountain pen ink had a slight bleed through, although the actual writing didn't feather out on the line. I'd say it would be about the same with a gel ink pen, so double-sided writing will have some shadow to it. That said, this is one of the best-looking and most thoughtful journals I've ever seen. If you're a reiki/chakra enthusiast this would be a great journal for detailing your work and thoughts, but it's perfect as a daily diary for the less esoterically inclined. 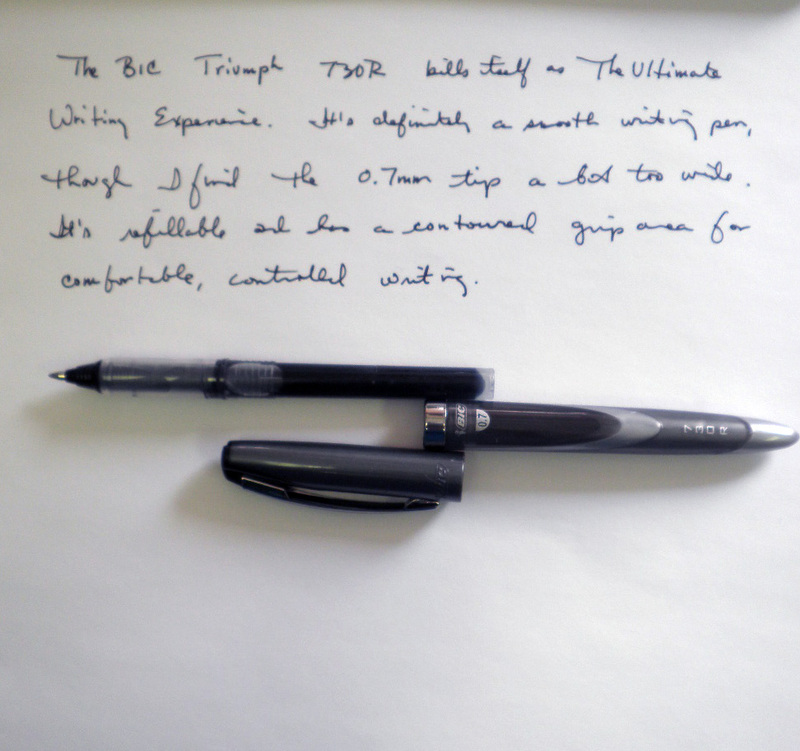 The BIC Triumph 730R rollerball is a sleek looking pen, with a molded plastic body that ends in a rounded point. Like it's sibling the Triumph 537R, it's a smooth writing gel ink pen that bills itself at The Ultimate Writing Experience. Perhaps, but one problem I find with it is that the cap won't post and I find myself misplacing it on my desk or around the office. I like to post the cap so I know where it is--with this, I have to hold it in my hand or else risk misplacing it. The other thing to mention is the 0.7mm tip, which is billed as a medium width but seems quite wider than that. I'm definitely going to swap out the refill for a 0.5mm when the time comes, as the line width just seems way too wide for my taste. As for writing, it's a great pen that is smooth but I'm not sure I'd call the ink flow controlled. I noticed the ink was very wet, and took a few seconds to dry. So smears and stains are definitely possible with this pen. But if you're not in a hurry, this is a great option. Two packs can be found in the office supplies aisle of your local supermarket, so take a look next time you're grocery shopping. When Cheryl from Writer's Bloc very generously offered me a set of Monami Love Pet gel ink pens to review I was really thrilled, and couldn't wait for them to arrive. What an incredible set of 10 gel ink, 0.38mm needle tip pens in a great array of colors. 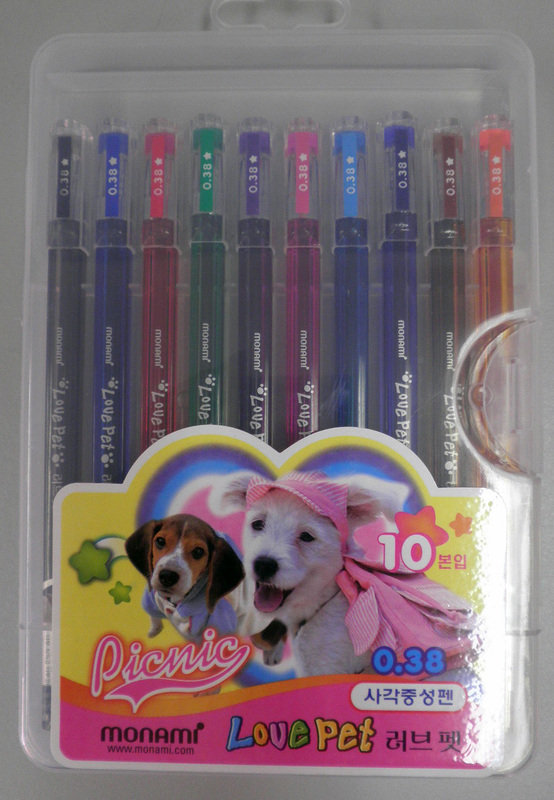 Each pen is labelled for a specific dog, and there's a small picture of a puppy on the end of the pen. I'm guessing that the Love Pet label is a literal translation of the Korean, and on a whimsical level it works well. Who doesn't love their pet? Whatever, let's move on to the pens and leave the explanation to someone else. First, the design: these are square pens and very easy to hold, the edges don't get in the way of holding the pen and so aren't really noticeable. All of the details are coordinated to the pen's color, so with orange you have an orange barrel, orange detailing on the barrel, and orange writing and accenting on the end where the specific dog picture is located. 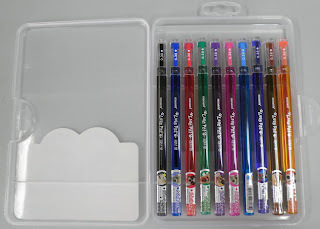 Each cap is labelled 0.38, and the 10 pens have their own plastic carrying case so you won't misplace a color in your bag. The colors are: black, dark blue, red, green, purple, pink, light blue/turquoise, navy blue, brown, and orange. Each one features a dog, such as a maltese, siberian husky, shihtzu, fox terrier, and pomeranian. I have to say that the first blue above, which I think of as a regular blue, really caught my eye. It's a deeper blue, while the royal blue below has a decent touch of purple to it. 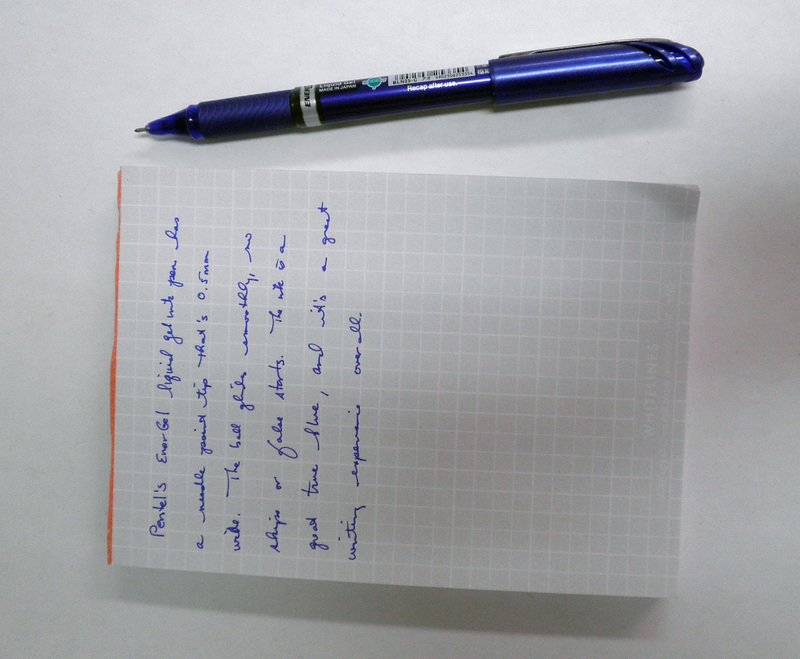 The 0.38mm width of the tip is perfect for both reading and writing, and the line seems to jump off the page. 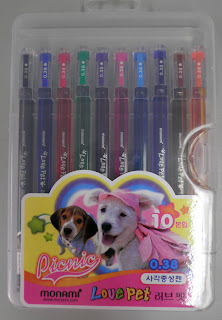 If you want just one Love Pet pen rather than the 10 pack, Writer's Bloc has the blue, black, and red available. The pens are refillable, and while I don't see a refill available at Writer's Block I'm pretty sure these are standard sizes. A Hi-Tec-C or something similar would probably fit, but an email or phone call would give you better information. The above pic shows them capped, posted, and taken apart to show off as much of the pen as possible. What a great pen set, and the price is quite reasonable. Definitely Shop Writer's Bloc, and check out the Monami Love Pet gel ink pen set. 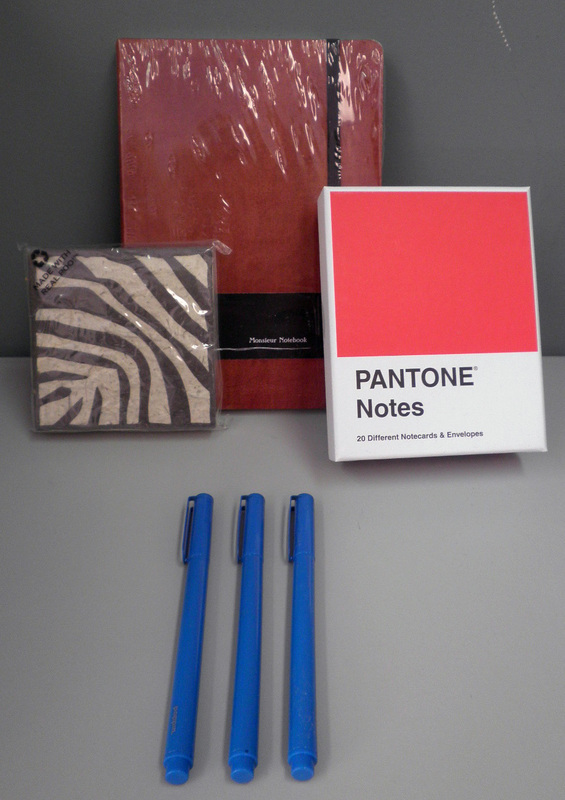 They also have an amazing selection of Clairefontaine and Rhodia notebooks and pads that make a great combination with the Monami Love Pet pens.